Gru (voiced by Steve Carell), is an archvillain with a soft spot for orphans in the animated film "Despicable Me." Gru - short for gruesome? - resembles a beaky Anton Ego, with a puffed-out midsection tottering atop flamingo legs. He is an arch archvillain with mommy issues and a Slavic accent, commanding an army of minions, yellow cylinders with goggle eyes. The minions assist him in nefarious, headline-grabbing schemes like stealing the Times Square Jumbotron. (Oh, the horror!) When he learns that a younger archvillain has made off with the Great Pyramid of Giza, Gru aims for the moon: He will steal it. Take that, Junior! Gru (voice of Steve Carell) is the title character in Despicable Me, a derivative 3-D animation, affable if utterly inconsequential. Who dares to challenge Gru as the "greatest villain of all time"? Vector, a nerd in a leisure suit (voice of Jason Segel), whose father runs the Bank of Evil (formerly Lehman Brothers). Vector has invented a ray gun that shrinks its targets. If Gru can storm Vector's ultramodern bunker, he can steal the gun, shrink the moon to the size of a soccer ball, disrupt the tides, and reclaim the title Earl of Evil. Animated by the French outfit Mac Guff Ligne - which deploys a handful of coming-at-ya 3-D effects - Despicable Me is a cluttered, overplotted inventory of dastardly deeds intended to show how being bad shrinks Gru's heart. Considerably more interesting than the arsenal of guns that freeze targets, shrink objects, or use squid as ammunition is the backstory explaining how Gru grew up. Nothing he invented as a child - rocket, fission device, or useful invention - could earn him a smile from his disapproving mother. As Mom, Julie Andrews' expressive grunts of eh, feh, and meh constitute the film's most eloquent dialogue. 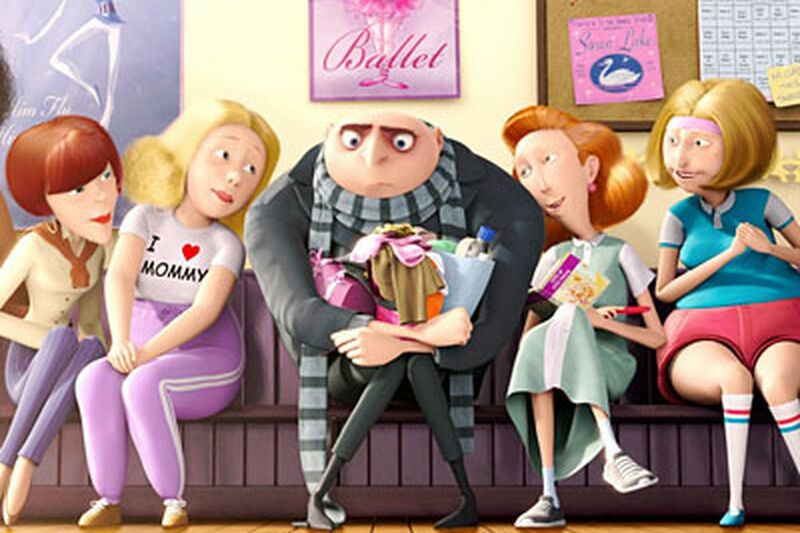 Short, sweet-and-sour, and amusing rather than funny, Despicable Me can't help but be likable.